Cala Cerrada: the first beach within the Águilas municipality and Region of Murcia. 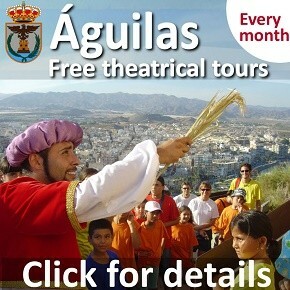 The two beaches are popular in summer with bathers who prefer to stay away from the built-up centre of Águilas, with many people attracted by the fine sand on the 150-metre curving shoreline of the cove, the attractive landscape featuring wind-sculpted sandstone rocks, the clear water and calm bathing conditions (the cove is protected on all but the south-western side) and the easy parking: plenty of space is available on the scrubland behind the Punta Parda, the headland which separates Cala Cerrada from Playa de la Carolina. 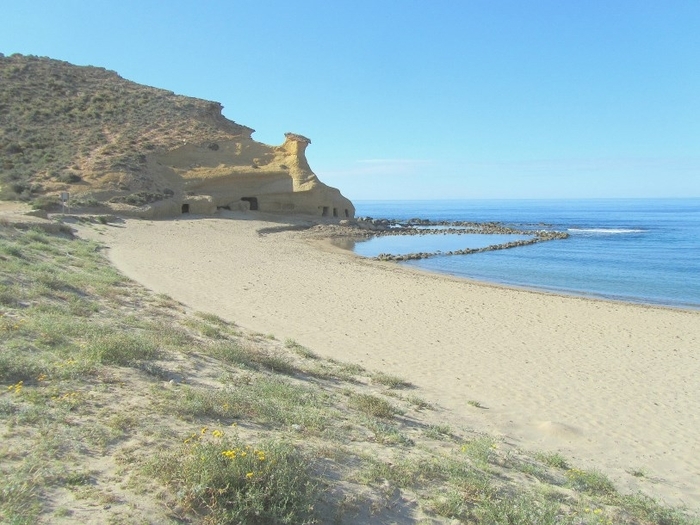 This same headland provides an attractive ramble for those who tire of sunbathing, and from the top there are panoramic views out towards Cabo Cope in the east and Mojácar and Carboneras to the south-west. 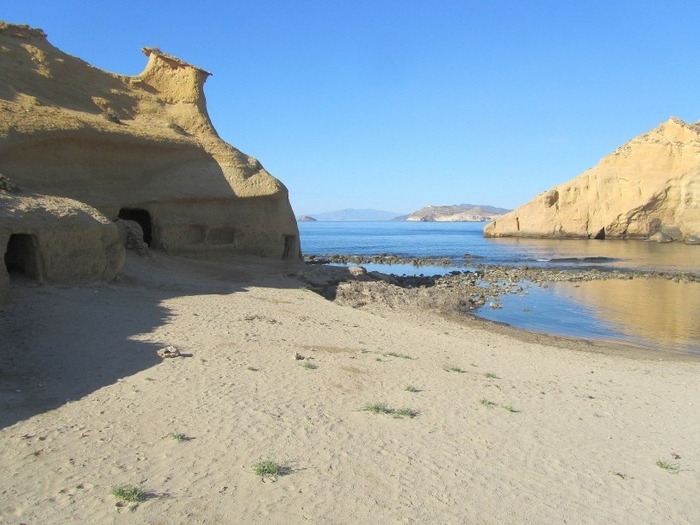 Some of the caves in the rocks around this cove were used in the past by people who cooked and boiled the esparto grass which was one of the main products of the area of Águilas, and this practice is the origin of the name of “Los Cocedores” which is sometimes given to the beach. Access is from the roundabout where the A-332 road in Andalucía joins the RM-333 in the Region of Murcia, and is via the track which leads off to the left at this point: the right fork takes cars to the equally attractive Playa de las Palmeras. 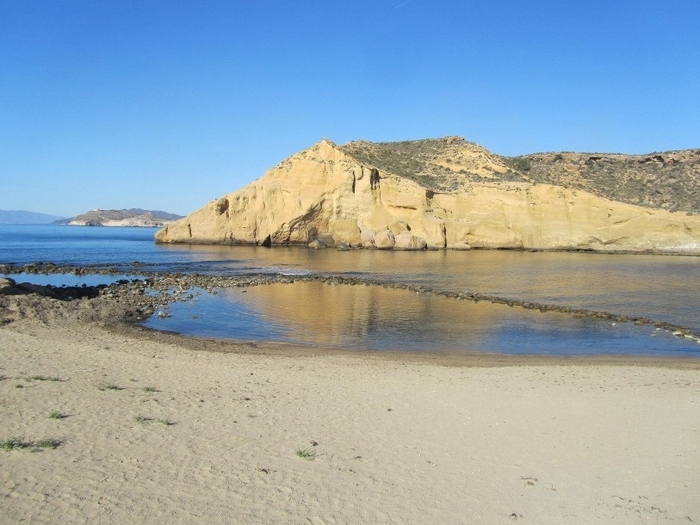 Cala Cerrada is one of four beaches which are included in the Cuatro Calas area, which is an officially protected part of the landscape in Águilas and the neighbouring municipality of Pulpí. The other three beaches in this area are Playa de la Carolina, Playa Higuerica and Calarreona. 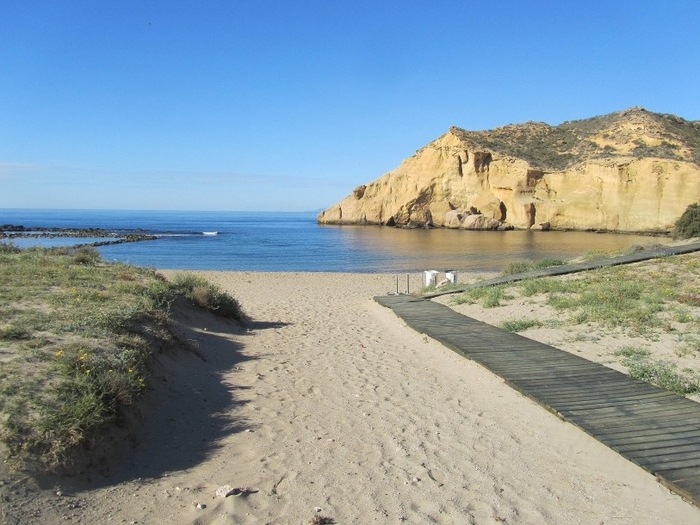 Facilities at Cala Cerrada and the Playa de la Carolina are sparse, logically enough given the location within a protected area, although there is a restaurant which opens in the summer and is kept busy by the many visitors to this part of the coast. There are no showers or lifeguards, and visitors out of season are advised to bring a picnic and plenty to drink. 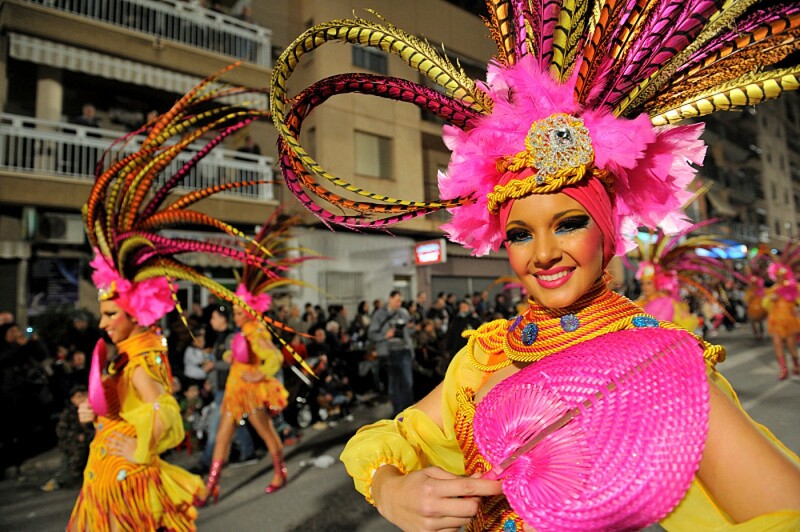 The fact that the main road into Águilas is so close at hand, though, means that shops and bars are only five minutes away by car, and those at Calarreona are closer still. Public toilets are provided in summer, and although in theory access is possible for those of limited mobility this area is not recommended for those who require wheelchairs, as getting from the car to the beach would be a problem.